Xavier, J. C. Velez, N. Trathan, P. N. Cherel, Y. De Broyer, C. Cánovas, F. Seco, J. Ratcliffe, N. and Tarling, G. A. 2018. Seasonal prey switching in non-breeding gentoo penguins related to a wintertime environmental anomaly around South Georgia. Polar Biology, Vol. 41, Issue. 11, p. 2323. Queirós, José P. Cherel, Yves Ceia, Filipe R. Hilário, Ana Roberts, Jim and Xavier, José C. 2018. Ontogenic changes in habitat and trophic ecology in the Antarctic squid Kondakovia longimana derived from isotopic analysis on beaks. Polar Biology, Vol. 41, Issue. 12, p. 2409. Rosa, Rui Lopes, Vanessa M. Guerreiro, Miguel Bolstad, Kathrin and Xavier, José C. 2017. Biology and ecology of the world’s largest invertebrate, the colossal squid (Mesonychoteuthis hamiltoni): a short review. Polar Biology, Vol. 40, Issue. 9, p. 1871. Coelho, Rui C.G. Marques, Ana L.P. Oliveira, Sara M. Diogo, Gabriela S. Pirraco, Rogério P. Moreira-Silva, Joana Xavier, José C. Reis, Rui L. Silva, Tiago H. and Mano, João F. 2017. Extraction and characterization of collagen from Antarctic and Sub-Antarctic squid and its potential application in hybrid scaffolds for tissue engineering. Materials Science and Engineering: C, Vol. 78, Issue. , p. 787. Pereira, JM Paiva, VH and Xavier, JC 2017. Using seabirds to map the distribution of elusive pelagic cephalopod species. Marine Ecology Progress Series, Vol. 567, Issue. , p. 257. Xavier, José C. Raymond, Ben Jones, Daniel C. and Griffiths, Huw 2016. Biogeography of Cephalopods in the Southern Ocean Using Habitat Suitability Prediction Models. Ecosystems, Vol. 19, Issue. 2, p. 220. Seco, J. Roberts, J. Ceia, F. R. Baeta, A. Ramos, J. A. Paiva, V. H. and Xavier, J. C. 2016. Distribution, habitat and trophic ecology of Antarctic squid Kondakovia longimana and Moroteuthis knipovitchi: inferences from predators and stable isotopes. Polar Biology, Vol. 39, Issue. 1, p. 167. Vélez-Rubio, G. M. Tomás, J. Míguez-Lozano, R. Xavier, J. C. Martinez-Souza, G. and Carranza, A. 2015. New insights in Southwestern Atlantic Ocean Oegopsid squid distribution based on juvenile green turtle (Chelonia mydas) diet analysis. Marine Biodiversity, Vol. 45, Issue. 4, p. 701. Guerreiro, M Phillips, RA Cherel, Y Ceia, FR Alvito, P Rosa, R and Xavier, JC 2015. Habitat and trophic ecology of Southern Ocean cephalopods from stable isotope analyses. Marine Ecology Progress Series, Vol. 530, Issue. , p. 119. Xavier, JC Walker, K Elliot, G Cherel, Y and Thompson, D 2014. Cephalopod fauna of South Pacific waters: new information from breeding New Zealand wandering albatrosses. Marine Ecology Progress Series, Vol. 513, Issue. , p. 131. Xavier, J. C. Louzao, M. Thorpe, S. E. Ward, P. Hill, C. Roberts, D. Croxall, J. P. and Phillips, R. A. 2013. Seasonal changes in the diet and feeding behaviour of a top predator indicate a flexible response to deteriorating oceanographic conditions. Marine Biology, Vol. 160, Issue. 7, p. 1597. Xavier, José C. Barbosa, Andrés Agustí, Susana Alonso-Sáez, Laura Alvito, Pedro Ameneiro, Julia Ávila, Conxita Baeta, Alexandra Canário, João Carmona, Raquel Catry, Paulo Ceia, Filipe Clark, Melody S. Cristobo, Francisco J. Cruz, Bruno Duarte, Carlos M. Figuerola, Blanca Gili, Josep-Maria Gonçalves, Ana R. Gordillo, Francisco J.L. Granadeiro, José P. Guerreiro, Miguel Isla, Enrique Jiménez, Carlos López-González, Pablo J. Lourenço, Sílvia Marques, João C. Moreira, Elena Mota, Ana M. Nogueira, Marta Núñez-Pons, Laura Orejas, Covadonga Paiva, Vitor H. Palanques, Albert Pearson, Gareth A. Pedrós-Alió, Carlos Peña Cantero, Álvaro L. Power, Deborah M. Ramos, Jaime A. Rossi, Sergi Seco, José Sañé, Elisabet Serrão, Ester A. Taboada, Sergi Tavares, Sílvia Teixidó, Núria Vaqué, Dolors Valente, Tiago Vázquez, Elsa Vieira, Rui P. and Viñegla, Benjamin 2013. Polar marine biology science in Portugal and Spain: Recent advances and future perspectives. 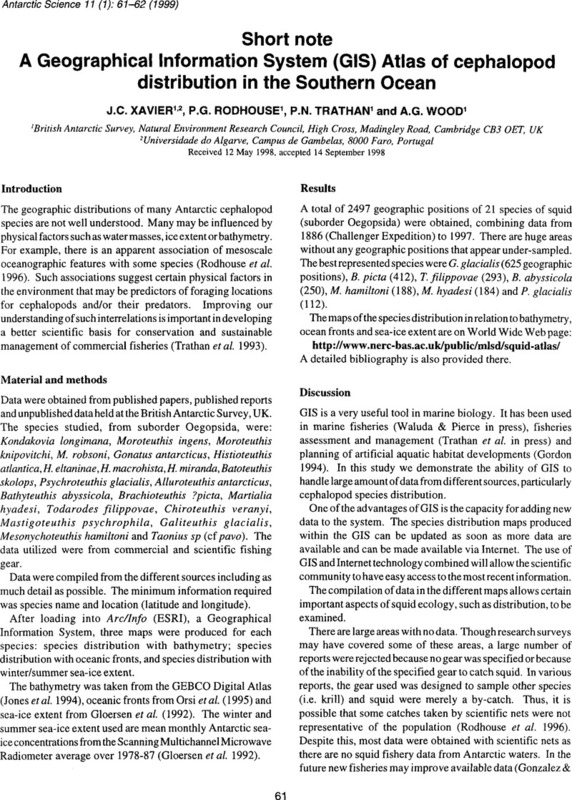 Journal of Sea Research, Vol. 83, Issue. , p. 9. C. Xavier, J. A. Tarling, G. and P. Croxall, J. 2006. Determining prey distribution patterns from stomach-contents of satellite-tracked high-predators of the Southern Ocean. Ecography, Vol. 29, Issue. 2, p. 260. Xavier, José C. Croxall, John P. and Cresswell, Kate A. 2005. BOLUSES: AN EFFECTIVE METHOD FOR ASSESSING THE PROPORTIONS OF CEPHALOPODS IN THE DIET OF ALBATROSSES. The Auk, Vol. 122, Issue. 4, p. 1182.